This Award winning registered Section D stallion came from the very best of proven Welsh blood - renowned for it's versatility Worldwide. He had magnificent loose paces, with powerful leverage in his hocks which gave him excellent uphill movement along with superb jumping ability. 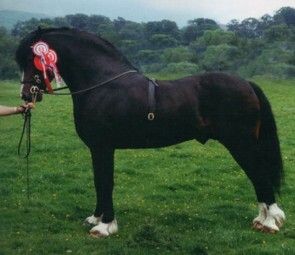 Carregcoch Bleddyn was a consistent winner in hand, always in the top 3, with many championship wins, including champion of all breeds. Carregcoch Bleddyn's sound fundament, correct conformation and adorable temperament, together with intelligence, elasticity and carefulness, all combined to make him a top class sports horse/pony sire. He has sired top class horses and ponies who excel in all disciplines, including another SPSS Elite stallion, Machno Carwyn - the leading pony showjumping stallion of all time. No other stallion has 4 national gold medals and 2 European Individual Gold medals to his name. In recognition of his achievements as a sire, Carregcoch Bleddyn was proclaimed as the Leading sire of Performance Ponies of the UK in 2005. This was awarded by the British Equine Federation and sponsored by the SPSS. Machno Carwyn, is the leading show jumping pony stallion of all time - during the 28 years since the beginning of the Pony European Championship - no other stallion has gained a medal, whilst he has two individual Golds - 2000 Hagen, Germany - 2001 Veyjer de la Frontera,Spain. At only 7 years old, he was 11th in the finals of the individual - his European Championship debut. 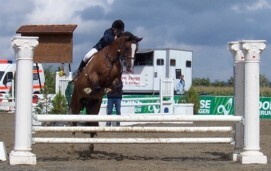 He was also 4th in the individual final at Lanaken, Belgium 2002 with a 12 year old rider - see picture on left. He won the Gold medal at the Swiss National Championships no fewer than four times and one Bronze. These are highlights of his career with numerous other titles and awards to his name. He placed in 130 top international competitions winning more than 50 and also placed in more than 25 international Grand prix winning 7. In 2004, at the age of 12, sadly this came to a premature end due to eye injury, should this genius have continued, just imagine the feathers in his cap! 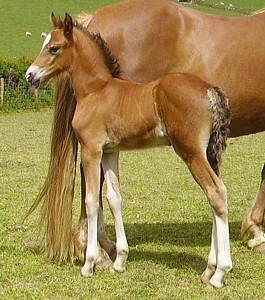 Machno Della, born 23rd May 2004, This 13.2hh beauty was shown for the first time at Gwynedd Breeders foal show 2004, was 1st in the Section C filly class and went on to be reserve champion. Also 1st in the breeders exhibiter class which included all sections. Now sold to the famous Wyken stud, she continued her winning ways as a yearling, gaining many in-hand championships. All this is a stop gap before being produced under saddle. 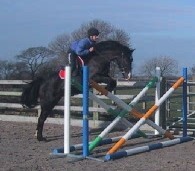 Her brother Machno Dawnus - 1999, 13.2hh has been exported to Switzerland and is winning classes against horses! 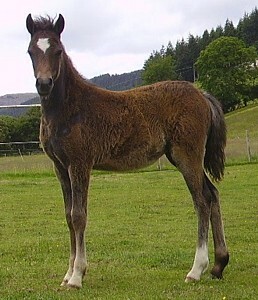 Machno Radiance (out of Machno Rowena), a 15.2hh gelding born in 2007. Owner by Sally Hoyle, Radiance started competing at BE90 level in May 2015 and at his 3rd event finished on his dressage score in 6th place. In September 2016, Radiance and his rider Sarah Colgan moved up to BE100 and they were 5th in their first event. Since then, they have completed a further 4 BE100s (at end April 2016) and have achieved 4 Regional Qualifications (by finishing in the 10% of the class). Radiance and Sarah plan to move up to Novice at Buckminster in July 2016. 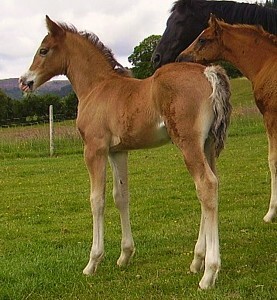 This pony (pictured as a rising 4yo) is a prime example of how Carregcoch Bleddyn stamps his stock, being very agile, careful with excellent jumping technique and paces to match-with the calibre to go to the top. Showtime went to the BEF Young Pony Evaluation in Stone, Staffordshire, on 20th April 06 and was the highest scoring pony and was awarded Performance and Breeding Diplomas. Then at the final for the BEF Young Pony Evaluations, Showtime was top jumping pony. This mare spent time breeding and before embarking on her sporting career in Switzerland. Proving to be a top class jumper, being 6th of 70 in a horse class in Feb 06 and consistently gaining double clears. Her owners being so impressed they now have have 4 Machno ponies.